Upper tier; for 3 & 4 metal lowside by Mears & Stainbank 1921. Lower tier; iron lowside on timber beams by Thomas Blackbourn 1899. Hollow box-section iron headstocks: 1 & 2 by Mears & Stainbank 1921; 3 - 9 by John Taylor & Co 1978: 10 by Llewellins & James 1911. Fixed steel gudgeons, ball bearings, traditional-type wheels, stays and sliders. Strike notes only, left old style by John Taylor & Co 1978. This is a large detached tower, the door to which is in the south wall facing the church. Once inside, the upstairs ringing chamber is reached via a wooden staircase. Parking is in the road below the church. The bells go well, and handle well, although the tenor feels like it could do with a bigger wheel. The old eight were hung in a new iron frame by Thomas Blackbourn of Salisbury in 1900. On being augmented to ten by Mears in 1921, a new iron frame was added above, in which hang the 3rd and 5th. The bells were rehung and retuned by Taylors in 1978. Edward Jenner who invented the smallpox vaccine lived by the church, and there is a Jenner museum nearby. 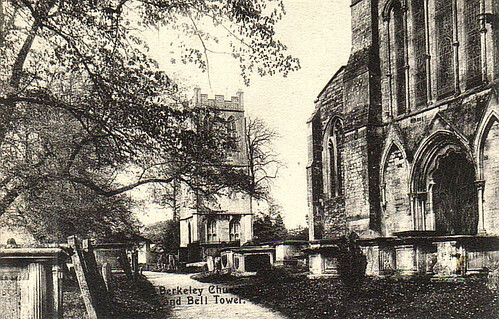 That the tower of the said parish Church of Berkeley is a very ancient building and suffered much in the late Civil War at which time great part of it was demolished. That the south side thereof is cracked from the bottom to the top. The south east corn is bulged from the rest of the tower and several loads of stone fallen out of the main wall. The foundations of the south west corn adjoining to the way leading to the church is broke away for several yards and the rest of the tower hangs over it, and the whole is so entirely out of repair that the same cannot (without a great part taken down) be repaired and amended, but will eventually fall down. The two oldest bells in the tower date from 1700 and 1722. They were cast by Abraham Rudhall of Gloucester. We know from the Churchwardens' Accounts that bells existed before this, the accounts for 1631 and 1637 record payments to ringers. In 1736 a payment of £3-17s-6d was made for "Mending clock &( )", By 1748 we have evidence that demolition work had started on the old tower. "To the workmen for (Caring) the lead and timber of the tower into the church and moving the Rubel" £10-0s-9d. The new tower was built by Mr Clark who in 1753 was paid £740. A survey of the bell frame and fitting was carried out by Mr Nott for a guinea. to Church, both Mornings & Evenings."